The 4K model now comes in two variants with a choice of 8th gen. 3.6GHz quad-core Core i3 or 8th gen. 3.0GHz 6-core Core i5. Both can be configured with an optional 8th gen. 3.2GHz 6-core Core i7. 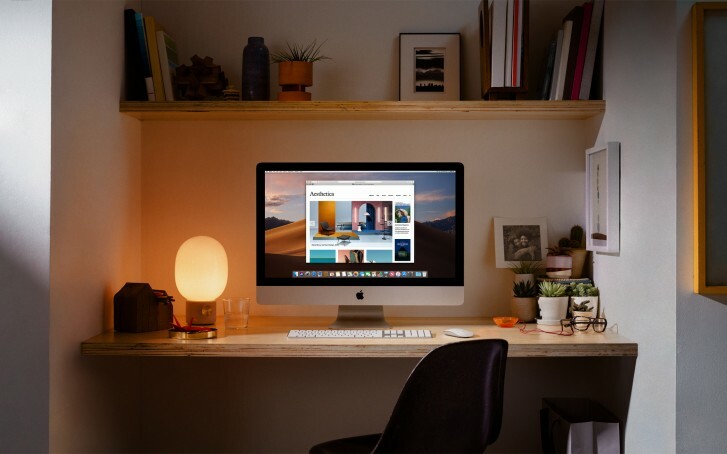 The 5K model comes in three variants, with a choice of 8th gen. 3.0GHz 6-core Core i5, 8th gen. 3.1GHz 6-core Core i5, and 9th gen. 3.7GHz 6-core Core i5. The second and third variants can be configured with a 9th gen. 3.6GHz 8-core Core i9. On the GPU side, the 4K model gets a choice of Radeon Pro 555X with 2GB GDDR5 on the base model and Radeon Pro 560X with 4GB GDDR5 on the higher-end model. The higher-end model can also be configured with a Radeon Pro Vega 20 with 4GB HBM2. On the 5K models, you get Radeon Pro 57X with 4GB GDDR5 on base model, Radeon Pro 575X with 4GB GDDR5 on mid model and Radeon Pro 580X with 8GB GDDR5 on the higher-end model. The higher-end model can also be configured with Radeon Pro Vega 48 with 8GB HBM2. In terms of memory, you get 8GB 2666MHz by default on all five models. The 4K models can be configured with either 16GB or 32GB. The same is true for the base and mid 5K models but the higher-end 5K model can be configured in 64GB as well. 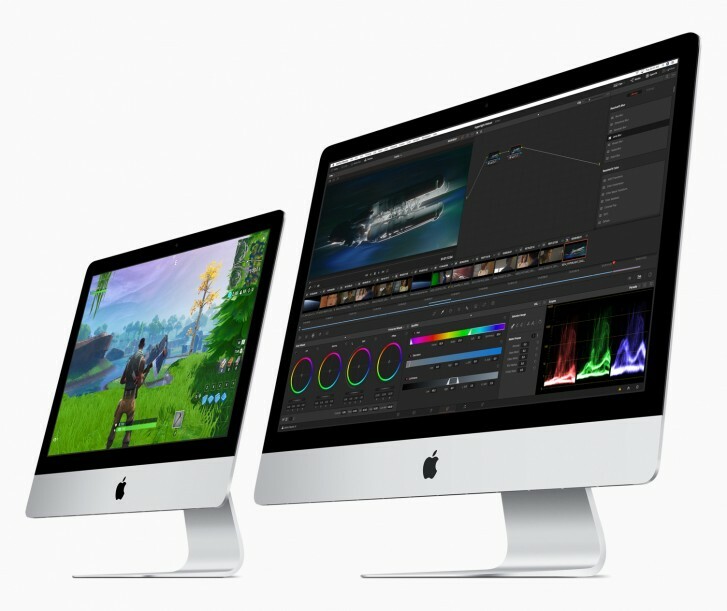 As an aside, Apple added a new tier for the iMac Pro when configuring memory. You can now get it configured with up to 256GB 2666MHz DDR4 for an eye-watering $5200. Coming back to the regular iMac, the storage options on all of them are rather terrible. All models come with mechanical hard drives, with the base 4K model having just a 5400-rpm drive. The other models feature Apple's Fusion Drive, which is just an SSHD. Default storage is 1TB on all but the higher-end 5K model, which gets 2TB. Apple offers SSD configuration options separately. That is pretty much it for the updates. The new iMac comes with the same design, which still manages to look great. It still has the same great 4K and 5K IPS panels with wide-color support and great range of connectivity options, including 4x USB 3 connectors, 2x Thunderbolt 3 connectors, Gigabit Ethernet, SDXC slot and headphone out. Unfortunately, the latest 9th gen. CPU is only available on the highest-end 5K model while the new AMD Vega GPU is also offered on the most expensive 4K and 5K variants, that too as an option. The storage is also pathetic by 2019 standards, as Apple is still shipping outdated mechanical hard drives. Lastly, the base 1080p model, which still exists, didn't receive any update at all. The new models are priced at $1299/$1499 for the 4K models and $1799/$1999/$2299 for the 5K models. They are available for purchase starting today but configuration options may or may not be available in your region. You don't understand technology and the prices it involves. But no worries, there's still time to learn all this stuff.